Stocks edged mostly lower Wednesday, breaking a six-day winning streak, as investors were disappointed by the latest round of earnings from U.S. companies. A surprise drop in new home sales also weighed on the broader market. The Standard & Poor’s 500 index lost 4.16 points, or 0.2 percent, to 1,875.39. The Dow Jones industrial average lost 12.72 points, or 0.1 percent, to 16,501.65 and the Nasdaq composite fell 34.49 points, or 0.8 percent, to 4,126.97. 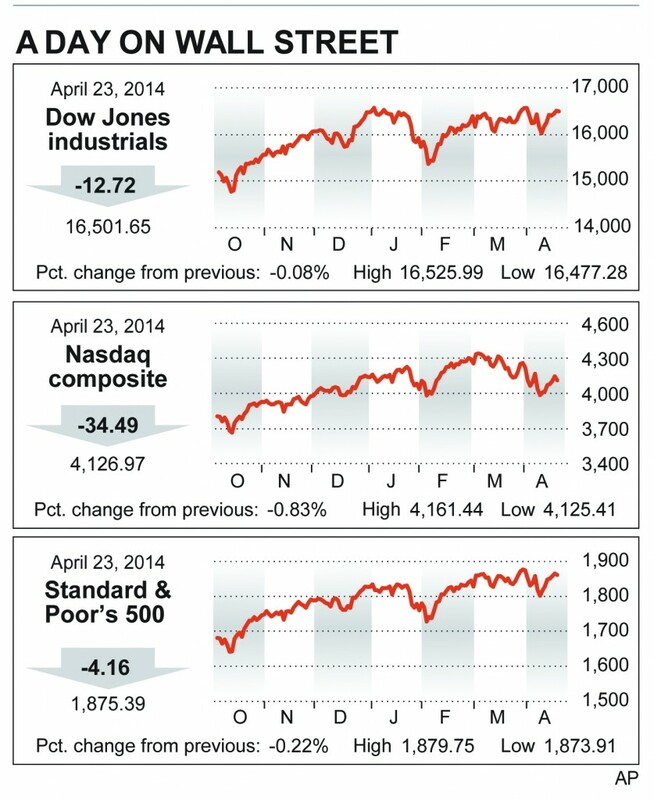 Since hitting a two-month low on April 11, the index had increased 3.5 percent through Tuesday. It is not unusual for the stock market to pause after such a rally. “The market, even with those six days of gains, is still struggling to choose a direction,” said Joseph Tanious, a global market strategist with J.P. Morgan Funds. High-flying biotechnology and Internet stocks were among the hardest hit. Surgical robot maker Intuitive Surgical fell the most in the S&P 500, plunging $48.40, or 12 percent, to $373.93. The company reported a 77 percent drop in first-quarter earnings and sold half has many robots as it did in the same period a year earlier. The company warned two weeks ago that earnings would come in far below expectations, causing its stock to fall sharply from a recent high of $540.63 reached April 3. Amgen fell 5 percent after it also reported a steep drop in quarterly earnings, missing analysts’ expectations. One bright spot in biotechnology was Gilead Sciences. The drugmaker rose $1, or 1.4 percent, to $73.86 after the company reported a surge in first-quarter earnings. Gilead’s drug Sovaldi, a new treatment for Hepatitis C, had $2.3 billion in sales in the first quarter alone, which beat the record for any drug in its first whole year on the market. While Sovaldi has a 90 percent success rate in curing Hepatitis C, the drug has a price of $1,000 per pill, or around $84,000 for a typical course of treatment. AT&T, despite posting quarterly results that beat analysts’ expectations, wasn’t able to impress investors this quarter. The Dow member’s shares fell $1.37, or 4 percent, to $34.92. The company reported earnings of 71 cents a share, one cent ahead of analysts’ expectations, and quarterly sales of $32.48 billion, which also beat expectations. Other telecom stocks also fell. Verizon fell 49 cents, or 1 percent, to $47.43 while T-Mobile US lost $1.28, or 3.8 percent, to $29.81. Airline stocks were among the biggest advancers. Delta Air Lines rose $2.14, or 6 percent, to $37.09. Delta’s first-quarter earnings climbed after the company filled more seats on planes and paid less for fuel. Delta was the biggest gainer in the S&P 500. Plane maker Boeing rose $3.08, or 2.4 percent, to $130.63. Its quarterly earnings beat expectations as its commercial jet production increased. U.S. company earnings have been generally coming in better than what investors had expected. But expectations are low this quarter, investors said, because the harsh winter earlier this year slowed business activity across the country. Earnings in the S&P 500 are expected to be down 1.5 percent from a year ago, according to FactSet. “When you set the bar so low, U.S. companies are able to walk right over them,” Tanious said. • Apple jumped $43.91, or 8 percent, to $568.43 in after-hours trading. The technology giant reported a profit of $10.2 billion, or $11.62 a share, beating analysts’ forecast of a profit of $10.19 a share. The company also announced it would increase its share buyback program from $60 billion to $90 billion, raised its quarterly dividend to $3.29 a share, and also announced a seven-for-one stock split. • Facebook reported a profit of 34 cents a share, well ahead of the 24 cents per share analysts had expected. Facebook shares rose $1.74, or 3 percent, to $63.10 in aftermarket trading. This article appeared in print on page 18 of the April 24th, 2014 edition of Hamodia.